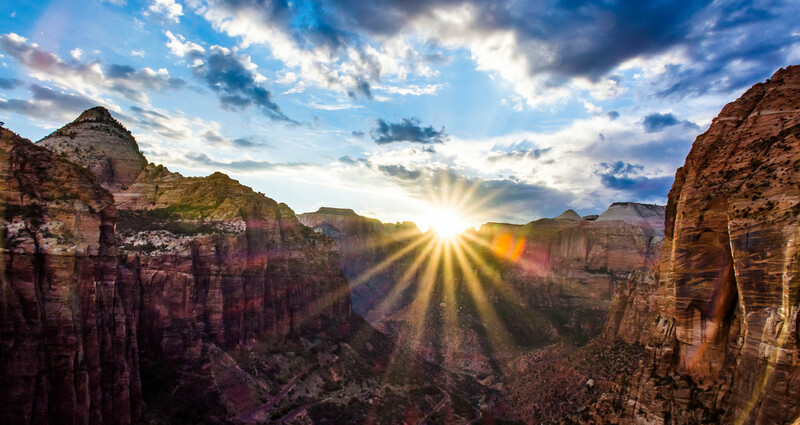 THROWBACK THURSDAY: A LOOK BACK AT ZIONS NATIONAL PARK ! This is a special edition series on the National Parks. I guess there are National Parks in countries other than the United States. Some in other countries are called National Reserves, or National monuments. I guess the one great thing is whatever country you live in, when you get a special recognition like this, I think it means that this particular area is just “busting out” with beauty. Right? And every national park, or national reserve or monument is this way. I would love to highlight countries, parks, monuments, states, etc, to show of the beauty around us. And today, a very unique National Park located in Utah, United States of America. Zion Canyon is so unique in it’s scenery. How do you describe this to someone? It has canyons like the Grand Canyon, and but big majestic mountains like Yosemite, all in one area. There are trails throughout the park, and it is certainly filled with incredible scenery. This area here is actually called Zion’s Canyon. People that come into this canyonare usually struck with awe as they look on both sides of them and see thegrandeur of cliffs on both sides of them. Colorful orange colored rock formations, that tower tothe heavens lined with beautiful green foliage. To a lot of people in the early year, theyoften felt like they were in “Zion”, a place of solitude or a place heavenly. So, here is a view of one of the canyons. Some people when they see this think that this must be the Grand Canyon, but, no, that is hundreds of miles away. Plus, this has green foliage in the bottom of this canyon. So, it is much different. The geology of the Zion and Kolob canyons area includes nine formations that together represent 150 million years of mostly Mesozoic-aged sedimentation. At various periods in that time warm, shallow seas, streams, ponds and lakes, vast deserts, and dry near-shore environments covered the area. Uplift associated with the creation of the Colorado Plateaus lifted the region 10,000 feet (3,000 m) starting 13 million years ago. Another famous part of Zions Canyon: ” The Narrows”. Many people have lost their lives here because, as calm and serene as this seems, it may catch you by surprise if a nearby storm sends a rush of water down the canyon and you are not prepared for a wall of rushing water. It is a scary thought to find yourself trapped through this. The rock formations in Southern Utah and Arizona are the most unique of anywhere in the world. But, looking at this mountain, don’t you just wonder how this one was formed through time? Maybe God was having fun playing in the creation of the world. This is simply called: “Checkerboard Mesa”. Not all National Parks are open in the winter. Zions Canyon is one of the rare ones, because the beauty of the canyon does not cease in winter. This is “Lower Emerald Pools” in the winter, and it simply breathtaking. Another photo of “Zion Canyon” in winter. It just makes things take on a whole new meaning to beauty in each of the seasons. This massive mountain just comes out of nowhere. Right in the middle of the canyon. Appropriately named: “Angels Landing”. Similar to Yellowstone National Park, the wildlife is usually easy to spot. Not quite so tame, but they will pose for you. Did you notice the one in the front smile for you? JK. But, there is a lot of wonderful wildlife in this beautiful National Park. So, speaking of a beautiful photographic spot, can you believe they have constructed a trail you can go up to the top of “Angels Landing”? Breathtaking to say the least. The Virgin River is the main river that cuts it’s way through this main canyon. It makes the beauty of the canyon even more beautiful with it’s slow and winding flow. This particular part of the canyon is called: “The Subway” Would you like to take your boat through this? Hmmm, can be intimidating. And this is the entrance and exit into the park. Notice anything different here? Down here when all you have is red dirt to make the roads, the roads turn out to be red, also. It just adds to the beauty of driving through here. Really, no one adds color dyes to the cement, it is just because there is so much red clay and red soil they use to make the road with. Well, I hope you have enjoyed this photographic journey of Zions Canyon National Park. One of the most beautiful places in the world. Millions of people come from all over the world to see this every year. It is one of the most visited National Parks in all of the United States.